Ovid introduced the architect and artificer Daedalus in the previous myth of the Minotaur, as the person who made the labyrinth within which the monster was confined. This provides a smooth link to the next myth, that of Daedalus and his son Icarus. After he had built the labyrinth, Daedalus – who was not a Cretan, and was being held on the island by Minos – yearned to leave Crete and return home. With the sea barred to him, he decided to take to the air. for it is mindful of its former fall. This is one of the most famous stories from the Metamorphoses (which Ovid also told in more detail in his Ars Amatoria), and has inspired a great many wonderful paintings. I have previously looked at many of them, and analysed their narrative in relation to Ovid’s (see links below). Here is a selection of the best. 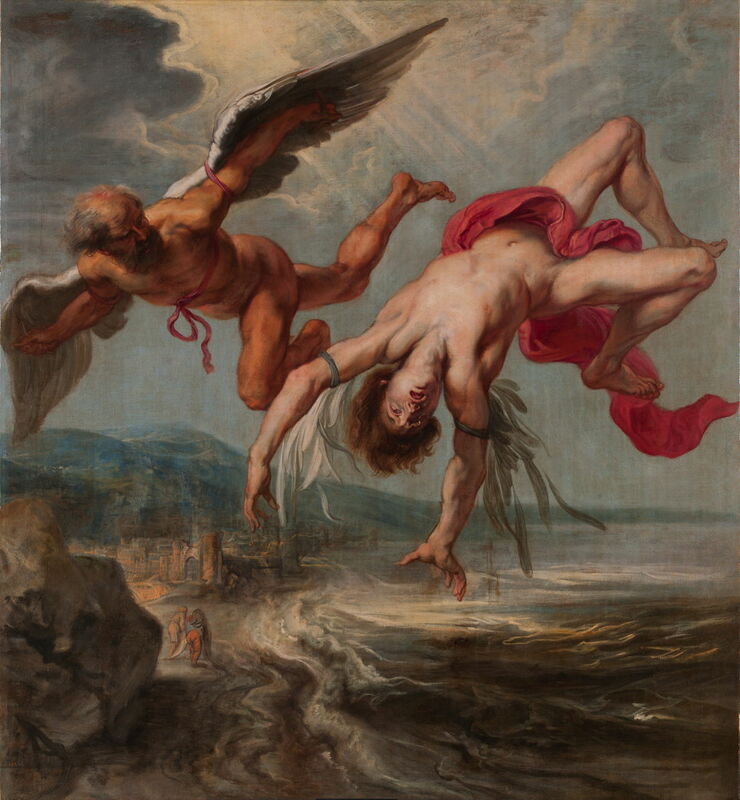 Van Dyck’s Daedalus and Icarus (1615-25) shows Daedalus giving his son the vital pre-flight briefing. From the father’s gestures, he is here explaining the importance of keeping the right altitude, which proved to be the son’s downfall. 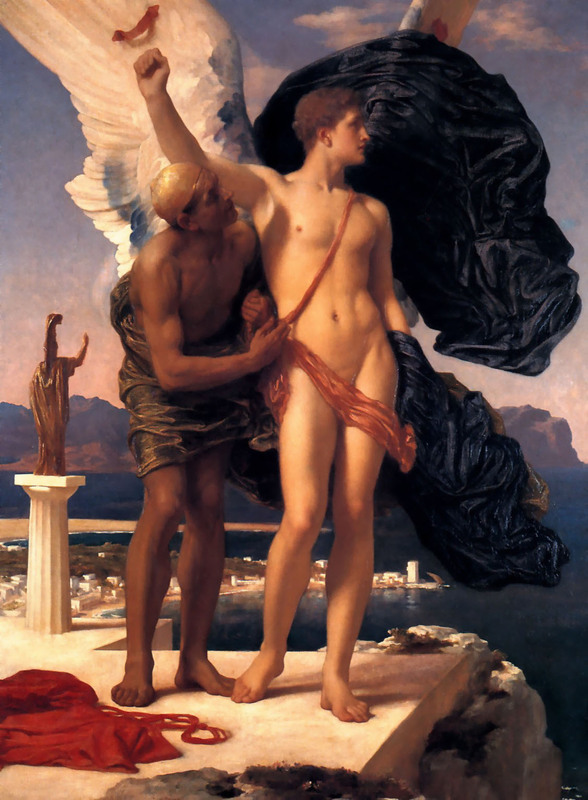 Frederic, Lord Leighton’s Icarus and Daedalus (c 1869), shows the pair on the roof of a tower overlooking the coast. Daedalus is fitting his son’s wings, and looks up at Icarus. The boy holds his right arm up, partly to allow his father to fit the wings, and possibly in a gesture of strength and defiance, as the two will shortly be escaping from Crete. Icarus looks to the right, presumably towards their mainland destination, and Daedalus is wearing a curious scalp-hugging cap intended for flight. 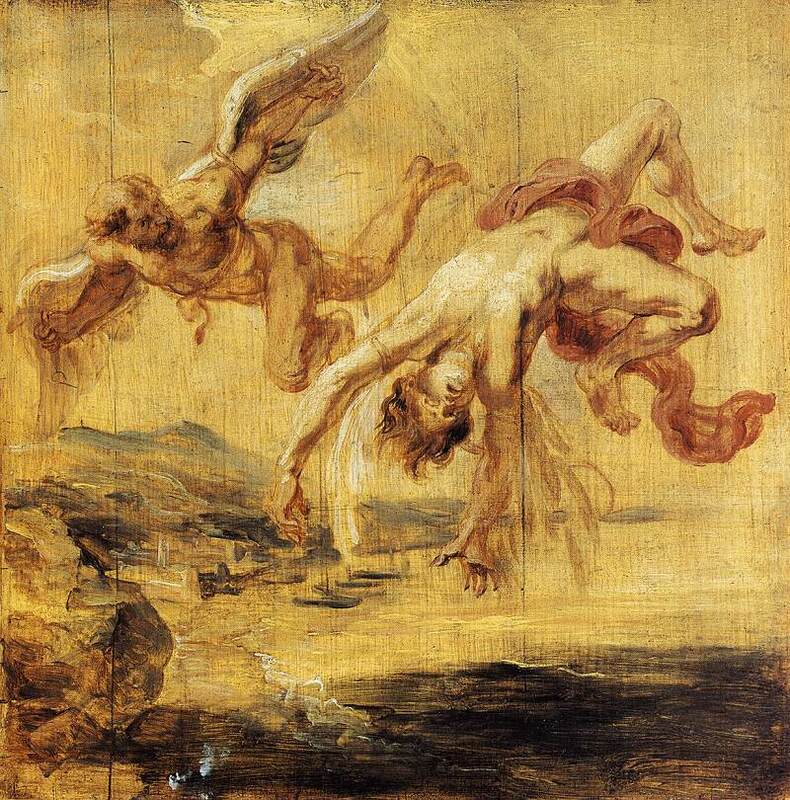 Rubens’ initial oil sketch of The Fall of Icarus (1636) above, was presumably turned into a finished painting by his apprentice Jacob Peter Gowy, below. Icarus, his wings in tatters and holding his arms up as if trying to flap them, plunges past Daedalus. Icarus’ mouth and eyes are wide open in shock and fear, and his body tumbles as it falls. Daedalus is still flying, his wings intact and fully functional; he looks alarmed, towards the falling body of his son. They are high above a bay containing people and a fortified town at the edge of the sea. 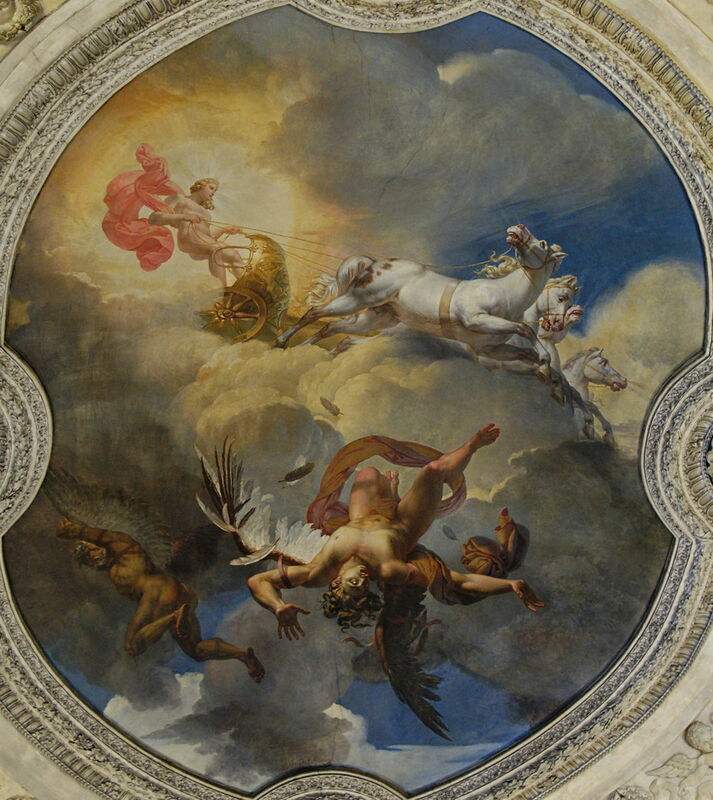 Blondel’s spectacular painted ceiling showing The Sun or the Fall of Icarus (1819) combines a similar view of Daedalus flying on, and Icarus in free fall, with Apollo’s sun chariot being driven across the heavens. To aid the viewer, de Momper has painted their clothing scarlet. 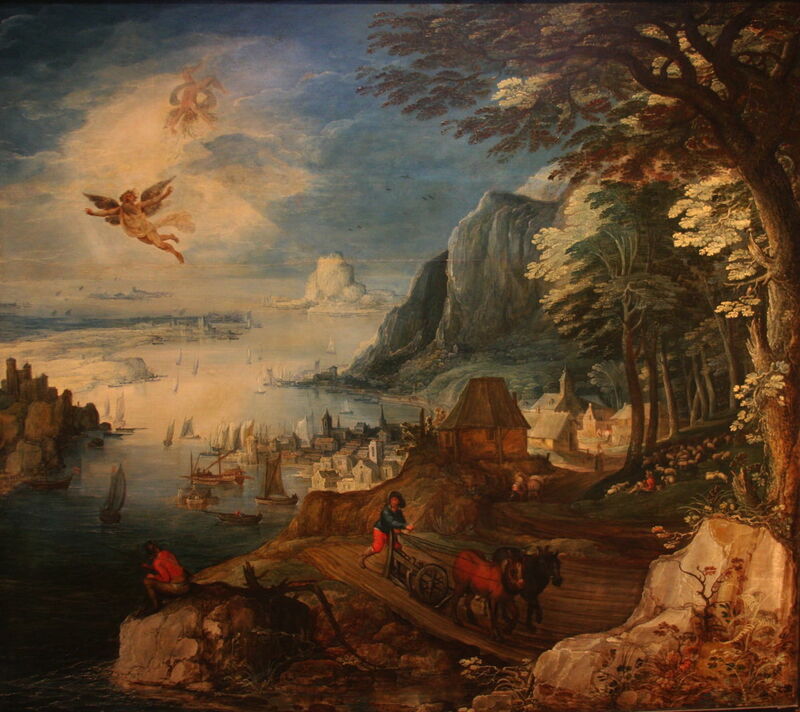 De Momper may also have made the copy, below, of Pieter Brueghel the Elder’s famous Landscape with the Fall of Icarus. Here, Brueghel makes the viewer work much harder to see the crucial elements of the story: all there is to be seen of Icarus are his flailing legs and some feathers, by the stern of the ship at the right. Daedalus is not visible at all, but the shepherd leaning on his crook is looking up at him, up to the left. 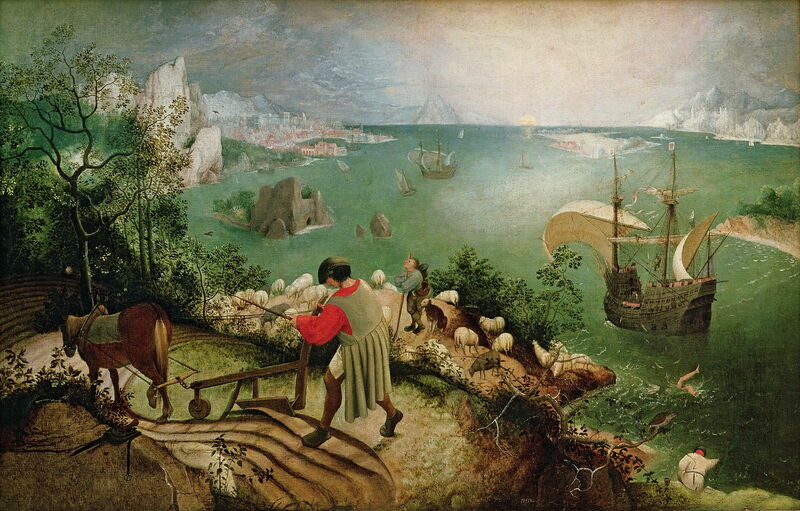 As in de Momper’s own version, Brueghel also shows the ploughman and the angler. Between them, these superb paintings tell the whole of the myth, in almost as much detail as Ovid. Posted in General, Language, Life, Painting and tagged Blondel, Bruegel, Brueghel, Daedalus, de Momper, Gowy, Icarus, Leighton, Metamorphoses, myth, narrative, Ovid, painting, Rubens, van Dyck. Bookmark the permalink.